Pimping your pavement, guerrilla gardens, nature deficit disorder – everywhere you look there’s a new buzz word to describe city-goers desire to bring the wilds back into their cities. All cities evolve in different ways depending on aesthetic and economic imperatives but sadly across the board, wildlife has been given the heave-ho. 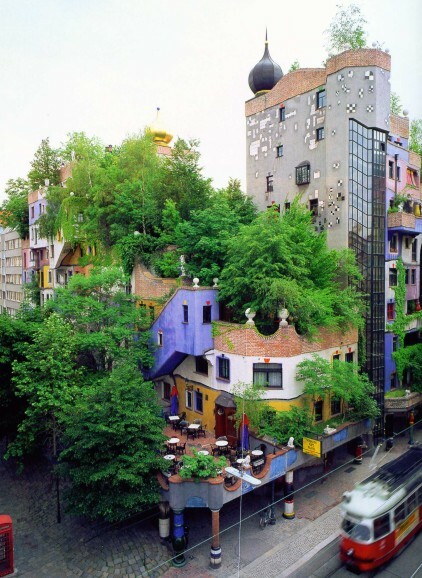 One man that tried to bring nature back into our cities resided right here in his twilight years – the Austrian architect Friedensreich Hundertwasser. As a kid he dreamed of cities covered in garden rooftops and living breathing buildings that changed their colours with the seasons. Indeed, during his lifetime he created a swathe of tree covered buildings, including the Kawakawa toilets. And although his philosophy was followed by a few fervent eco-warriors his ideas failed to catch on in a mainstream way. Hundertwasser passed away ten years ago, but finally his ideas are starting to gain currency. All over the world, a groundswell is afoot, as construction companies work with environmental groups to think re-think the design of their buildings. In the UK, the Green Building Council is making its buildings more wildlife friendly, by creating rooftop gardens, nesting cavities for swifts and starlings, and ledges that mimic cliffs for peregrine falcons. And in Holland, Forest & Bird’s Partner Vogelbescherming Netherlands has been working with construction agencies to create housing for not just residents, but also for their endangered house sparrow – a bird whose population has halved since the 1980s. For 60 years, the house sparrow has floundered on the IUCN’s red list, however by working with the companies to create bird-boxes and modify their guttering, these birds hopefully will make a comeback. Step back from the buildings though, and look upon your city from a beetle’s or a bird’s eye view, and no doubt you’d look upon it as a wholly unwelcoming place. It’s a minefield of monolithic concrete structures, drains, poisonous sites, motorways and dams. Sure, there might be some green, tree-filled refuges, but chances are they’re few and far between. Once you’ve concreted a city, drained the wetlands, erected apartments, built its vital infrastructure such as motorways and roadways , how do you retro-fit it with green spaces? How do you invite insects, bugs, beetles, lizards and birds back into the city? How do you give them good breeding and feeding grounds? One answer is to create wildlife corridors, something we’re working on in cities throughout New Zealand from Auckland to Wellington. Many of these corridors are already there – they’re your railways, your motorways – we just need to re-forest them, add in a few backyards and parks (to make the vital connections) and make sure they’re pest free. So far, we’ve been successful in creating bird corridors along some of Wellington’s and Auckland’s major arterial routes, and we’re working with hundreds of urban homeowners to ensure they provide pest-free refuges. The next thing we need to do is look further afield – at our railroads, our parks, our housing estates and other forgotten places to see where we can do some infill greening. And by doing so, we’ll not only be helping birds and beetles, but making our towns saner places for pedestrians, cyclists, train-goers and anyone who enjoys resting their eyes on bushy verges and bird-filled skies. Yes, The future of conservation is in our backyards, in our cities. Bringing nature to the people, by integrating nature into our cities and there are so many ways to do this. We inherently know we gain health and well being benefits from complex green spaces but we do not realize this importance, it is not reflected in urban design or urban planning or management. – Psychological benefits that allows people to cope with daily stresses, and these restorative benefits gained increase with the level of BIODIVERSITY ! We need to create urban spaces that are exciting and vibrant places to live by GOOD urban Design. Create positive places where people want to live. This little video (four minutes long), shows how kids in urban areas (Auckland City) can be involved in conservation just by going out into their backyard. (was one of my favourites to film! ).